Sacked workers from the car parts firm Visteon have been occupying three factories across the UK since Wednesday. The action began with an overnight sit-in at the Visteon plant in Belfast and employees are continuing their protest at the factory. More than 100 workers have staged a sit-in, the Unite trade union has said. Earlier, it was announced that 565 staff would go at Visteon car components plants across the UK. Most of the jobs have been lost with immediate effect and two hundred jobs will go at the Belfast factory. KPMG said it had no alternative but to close the factory and the two others in Basildon and Enfield in England. Administrators have been called in to the factory which is the former Ford plant. Visteon has a total workforce of 600 in the United Kingdom. Unite convenor John Maguire said the workers at the plant had "been treated disgracefully". "We have been left with no choice but to occupy the factory to save our jobs and to defend jobs for the people of Belfast," he said. Fifty people who were sacked on Tuesday are now on the roof of the Enfield plant. Others are holding a sit-in at the plant in Basildon in Essex. 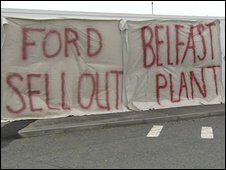 The protesters claimed the company's former owner and main customer, Ford, had promised redundancy contracts which they now want to see honoured. After car parts manufacturer Visteon announced job cuts workers occupied plants in Belfast, basildon and Enfiled. In Enfield about 70 workers - men and women from all kinds of backgrounds - are still inside the plant and on the roof. Last Tuesday the management called for a general assembly and told people that they would have to leave their workplace immediately. They were told to fetch their personal belongings the next day at 10 am. When people turned up the factory was already closed. Workers entered through an unlocked side entrance and occupied the plant. The security guards won't let people go inside, they also blocked the fire exists with padlocks - which is clearly illegal. Last night, Thursday 1st of April, two bailiffs entered the plant. They issued an eviction order, supported by five cops. The eviction order was flawed, e.g. it was not signed and it had the wrong address on it. Workers expect a proper eviction order for tomorrow, Friday, 3rd of April. In case of eviction workers plan to picket the plant. they also plan to go to Ford Dagenham for a solidarity picket. The plant manufactured parts for various car companies, for example Land Rover, Jaguar, Madzda, Renault, Ford. In 1991 there were still 1,100 people employed, this number came down to 250. Workers guess that Ford Southampton, the main 'client', piled up stock lasting several weeks - Ford Southampton announced redundancies and will eventually shift production of the Transit to Turkey. Links of solidarity between Enfield and Southampton is the most pressing. Demonstration outside the factory at 10am tomorrow. Any reports from Saturday's demo at Enfield?